Compliments of the season, It pleases me to see you here and I hope you are OK and how is life over there I hope OK? No matter what always give thanks to God for his grace, I am Miss Anna Itai Aka Koffi, 22 years old, single, a first year medical student in the University of felix houphouët-boigny, cocody, abidjan, ivory coast, I just want to wish you compliments and hope to know you better, in case you want to reach me you can do so through my email ID bellow. Compliment of the seasons and thank for your messages, I am very happy to communicate with you here and it pleases me to countinue with you to know you better and tell you all what you need from me, but I need your urgent help and I hope you would find this mail in good mood, although it might surprise you because we have not met neither in person only by correspondence, but I believe it takes just one day to meet or know someone either physically or through correspondence and believing you could be of great assistance in commences some kind of venture with you in your locality while I complete our education under your care if you do not mind. My name is Miss Anna Itai Aka Koffi, I am 22 years old girl from Sierra Leone but living in Cote D'Ivoire as an orphan and refugee in one of the churches here with my younger brother Jones 17 years Old who is currently very ill in the hospital right now, we ran away from home because of the war in my country and fear of been poison by relative. I am writing you to request you to be Our Business associate to Manage the fund which we inherited from Our late father Dr. Koffi who was also poisoned before the war in Sierra Leone by his business associates while on a business trip with my mother and our plans is to continue and complete our education in any country which was disrupted as a result of their death. With plea and tears, We would like to know your opinion regarding this offer so that I can detail you accordingly to enable you have access to the fund deposited with a security company as family Valuables and to receive it for investment or joint venture while we continue our education under your care with hope that you will not disappoint us. I am very happy to read from you again, I know about your age but that does not bother me becuase ages are just numbers, like what we both know that It takes just One day to know somebody and not 10 years just as we knew each other, concerning the world situation, i belive God wants to shake out the bad people and live the good once with a good heart to inherit the ealth and I pray that you and me would be among the few good once to inherit the ealth, really, I needed your help and I am doing this base on trust that you will not abandon me half way, which is my greatest fear but I am willing to take the risk knowing at the back of my heart that you are a nice person to that the risk of trusting you with huge amount sum of money, we do not know whom to turn to even if I should tell members of my family they may do all they can to harm me too and take away the money from us without giving us a dim, that is why we ran away from Sierra Leone to a land which they could not find us with the documents to the treasure with the security company. To tell you the truth this is the first time I am passing through this hardship and I pray that my enemies should not pass through this kind sufferings because they will not survive. Currently we are not in my country we am in Cote D Ivorie, Ghana border, for now as a refugee in a LOCAL MISSION HOUSE for refugees, which may not disturb my movement to you if I want, they are good to us they have been clothing us and feeding us too, I told them of my predicaments and they ask me to seek an assistance in a foreign land just as my late father told me and which was the agreements with my late father and the security company that I am the only person that could appoint a foreign person to make claim of this money with the security company and with much prayers and God direction I chose to mail you for help. You have nothing to fear or worry about becuase it is legal and 100% risk free provided you keep it to yourself and secret until the box of money gets to you for security reasons, all I need from you now is to help me liaison with the security company in Cote D'Ivorie where the box of money is kept, so that they would ship the box of money to your door step without the notice of anybody and in return you will send me money from the box for my education or for my trip to come and join you, I mailed the security company with the care taker here to demand for my Late father's funds but they said they would not release it to me until my late father foreign business partner make claim on it on our behalf, they said the contract signed by them was that until my late father foreign business partner make claim and mailed for the release of the consignments to anywhere with my approval since I am the next of kin, that is when they can attend to me or you. My greatest joy was they my late father did not give any name and that is why I chose you to help me. BUT PLEASE NOTE THAT IT IS VERY VERY LEGAL AND 100% RISK FREE PROVIDED YOU KEEP THIS TO YOURSELF UNTILL THE BOX OF MONEY FINALLY GETS TO YOU. I want you to stand for me and my younger brother as my late father business partner to make claims of this box of money so that the security company would release and ship the box to your door step, but note that the security company does not know that the box contains money all what they know is that the box contains family valuable for late Dr. Emanuel Abe Koffi, as soon as you have the box I will send to you the secret code to unlock the safe so that you can pay for all expensive, troubles and send us money for our education, then lodge the money into an account and you shall be the care taken of it and as the same time be our trustee and guardian, till we finish our education in any area of your choice you fill will be good for us but I will like to be a doctor like my late father to save souls. (1) Contact person in charge: Captain Fifi Coulibaly of Dynamic Securities Company (DSC/EDDS) Abidjan, Cote d'Ivoire. With this guideline all will be simple and went cordially remember this point at the back of your mind please the security firm holding this box till date has no good idea of the real content of the box all you know is that the content of the box is your business partner's family valuable. In other words do not disclose to the security firm that the box in their custody contains fund please please the reason for the disguise is to avoid tax and insecurity of the fund if disclose to the security firm, which my late father has worn me about, so be careful and please keep this to yourself and secret till i finally join you. I will be waiting to hear from you as soon as you contact the security firm and have any update or feed back for me please do not fail to excercise how urgent you will like the security firm to treat your shipment, they works round the clock 24/24 hours. Please get to them soon as you finish reading this mail as l will also send them a mail too from here. I shall be expecting your mail, as I told you that is 100% legal and risk free provided you keep this secret untill i finally join you or the box of money finally join you for safety reasons, soon as you hear from them do let me know. Incase you do not know what to write, I have given you some guide line below you can add or deduct if you want, but please make sure you add your contact numbers, both fax and telephone incase they want to reach you immediately. 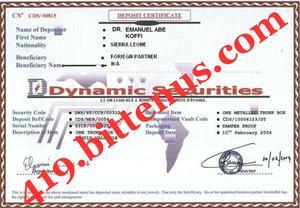 I, the undersigned Mr. , the business partner of Late Dr. Emanuel Abe Koffi, wish to make claims on the valuables deposited in your company on her name with the following data's, The deposit reference is DSC/MDR/0054. Please let me know kindly about the procedure of how to withdraw the "family valuable" of the above mentioned business partner. I which to cooperate with you to the success of this transaction. Looking forwards to hearing from you very soon. WITH DUE RESPECT THE COMPANY WISHES TO ACKNOWLEDGE THE RECEIVAL OF YOUR SHIPMENT REQUEST AND YOUR LATE BUSINESS PARTNER'S DAUGHTER HAS ALREADY APPROVED YOU AND ASKED US TO CONTACT YOU WITH THIS MAIL AND SHE HAS ALSO GIVING THE AUTHORITATIVE GO AHEAD DIRECTIVE TO THE COMPANY TO HONOUR YOUR SHIPMENT REQUEST FOR THE DIPLOMATIC SHIPMENT OF HER LATE FATHERS'S CONSIGNMENT ON HER BEHALF TO ANY DESIGNATED COUNTRY(S) WITHIN THE GLOBE/PART OF THE WORLD UNDER THE AUSPICES OF THE COMPANY DIPPLOMATIC COURIER MISSION WITHIN SHORTEST POSSIBLE TIME TO YOUR DESIGNATED. HENCE HER CONSIGMENT OF ONE METALLIC TRUNK BOX OF FAMILY VALUABLE HAS BEEN CLEARED BEFORE NOW AND AWAIT SHIPMENT TO ANY DESIGNATED VENUE WITHIN GLOBE EXPRESSLY. THEREFORE YOU ARE KINDLY REQUESTED TO PRINT OUT THE FORM, FILL, SIGN IT AND THEN RE-ATTACH IT AND SEND TO THE COMPANY BY EMAIL AS SOON AS POSSIBLE FOR URGENT OFFICIAL LEGALIZATION OF REQUIRED DIPLOMATIC SHIPMENT PARTICULARS AS WELL AS CHANGING EVERY PREVIOUS DOCUMENTATION INTO YOUR OWN NAME AS THE AUTHORIZED RECIPIENT /CONSIGNEE OF THE CONSIGMENT AT THE FINAL DESTINATION OF THE DIPLOMATIC SHIPMENT BECAUSE ALL DOCCUMENTS HERE CARRIES THE NAME AND ADDRESSES OF YOUR LATE BUSINESS PARTNER WHICH WE HAVE TO CHANGE INTO YOUR NAME AND ADDRESSES FOR EASY SHIPMENTS TO YOU. NOTE:-YOU HAVE EVERY OPPORTUNITY TO HAVE YOUR SHIPMENT REQUEST APPROVED, PROCESSED AND DIPLOMATICALLY LEGALISED TO BOAST THE SAID CONSIGNMENT DIPLOMATIC STATUES AND IMMUNITY IN COURSE OF ITS SHIPMENT TO AVOID DE -RESTRICTION OR INSPECTION OF THE CONSIGNMENT BY ANY AUTHORITY(S)OR ORGANIZATION FROM ITS ORIGIN TO FINAL DESTINATION AND IF YOU CAN PROVIDE ALL REQUIREMNETS UNDER 24 HOURS BY SUNDAY WE SHALL BE AT YOUR DOOR STEP. HENCE THIS OFFICIAL DIPLOMATIC LEGALIZATION OF REQUIRE DIPLOMATIC SHIPMENT PARTICULARS OF THIS SAID CONSIGNMENT WILL ATTRACT THE SUM OF FIVE HUNDRED AND FIFTY EURO (550 EURO) OR ITS EQUILAVIENT IN YOUR LOCAL CURRENCY KNOWN AS DIPLOMATIC ADMINISTRATIVE PROCESSING FEES (DAPF), THIS WILL EFFECT THE REGISTRATION AND CHANGING OF NAMES WHICH IS DON IN THE HIGH COURT AND NOT IN OUR OFFICE, BEACUSE ALL DOCCUMENTS HERE AS I HAVE EXPLAINED EAILIER ARE IN FAVOUR OF YOUR BUSINESS PARTNER AND WE HAVE TO CHANGE ALL TO YOUR AND ALSO THE PURPOSE OF THIS DAPF FEES IS TO GET ALL DIPLOMATIC SHIPMENT IMMUNITY PARTICULARS AND LEGALLY PUT YOUR NAMES INTO THE SHIPMENT PARTICULARS AS NEW RECEIVER/RECIPIENT OF THE CONSIGNMENT KNOWN TO THE COMPANY. THIS SEEMS TO BE THE ONLY OUTSTANDING FEES REQUIRED BY THE COMPANY'S LEGAL DEPARTMENT, SINCE THE DEPOSITOR HAS ALREADY PAID FOR SHIPMENT AND UPKEEPING OF THE BOX IN ADVANCE TILL DATE. THIS DAPF FEES SHOULD BE SEND THROUGH SPECIFIED SPEED TRANSFER MEDIUM SUCH AS THE WESTERN UNION OR THE MONEY GRAM TO THE COMPANY'S ACCREDITTED RECEIVING ACCOUNTANT. IN CONCLUSION THE COMPANY ALSO WISH TO INFORM YOU THAT THE VALIDITY OF ANY APPROVED SHIPMENT REQUEST FROM THE DATE OF APPROVAL IS ONLY ONE WEEK TO AVOID INCONVENIENCE ON THE COURIER OPERATION CURRICULUM. 1.YOUR IDENTITY-ANY RECENT PHOTOGRAPH OR PASSPORT OR DRIVERS LICENCE-PURPOSE FOR THIS IS FOR POSITIVE IDENTIFICATION OF RECIPIENT AT POINT OF FINAL DESTINATION BEFORE HANDLING CONSIGNMENT TO HIM OR HER AT FINAL DESTINATION. 2. THE FLLED AND SIGNED DIPLOMATIC SHIPMENT FORM ACCURANTLY AND RETURN. 3. 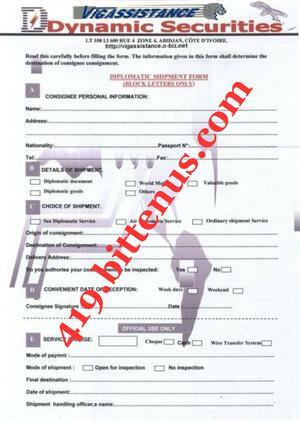 THE WIRE DETAILS OF THE DIPLOMATIC ADMINISTRATIVE PROCESSING FEES (DAPF) THROUGH THE MONEY GRAM OR WESTERN UNION TO ENABLE THE COMPANY LEGALISED YOUR DIPLOMATIC SHIPMENT PARTICULARS TO BOAST ITS DIPLOMATIC IMMUNITY AND PROCESSING ALL PREVIOUS DOCUMENTATION INTO YOUR NAMES AS THE RECIPIENT OF THE CONSIGNMENT AT FINAL DESTINATION . WE SHALL GET TO YOUR LATE BUSINESS PARTNER'S DAUGTHER TO INFORM HER THAT WE HAVE EMAIL YOU OUR REQUEST. FOR MORE URGENCY AND MORE INFO HUMBLY REQUEST YOU TOCALL +22506482972 NOTE THE COMPANY WORK ROUND THE CLOCK 24/24 HOURS SERVICE. WE ACKNOWLEDGED YOUR FILLED FORM ALTHOUGHT NOT PROPERLY SIGNED IN HAND WRITTING. NOTWITHSTANDING WE ARE WORKING SERIOUSLY TO PUT ALL YOUR INFORMATION TOGETHER AND START THE SHIPMENTS PROCCESS TO YOU, TO ACHIVE THIS SUCCESSFULLY WE STILL NEED YOUR PHOTO TO COMPLETE YOUR INFORMATION AND THE OFFICIAL DIPLOMATIC LEGALIZATION OF REQUIRE DIPLOMATIC SHIPMENT PARTICULARS OF THIS SAID CONSIGNMENT OF THE SUM OF FIVE HUNDRED AND FIFTY EURO (550 EURO) OR ITS EQUILAVIENT IN YOUR LOCAL CURRENCY KNOWN AS DIPLOMATIC ADMINISTRATIVE PROCESSING FEES (DAPF), THIS WILL EFFECT THE REGISTRATION AND CHANGING OF NAMES WHICH IS DON IN THE HIGH COURT AND NOT IN OUR OFFICE, BEACUSE ALL DOCCUMENTS HERE AS I HAVE EXPLAINED EAILIER ARE IN FAVOUR OF YOUR BUSINESS PARTNER AND WE HAVE TO CHANGE ALL TO YOURS. SOON AS YOU SEND THE FEES TO THE ABOVE NAMES AND ADDRESSES DO LET US HAVE THE WIRED DETAILS LIKE THE CONTROL NUMBERS, QUESTION AND AWNSER IF ANY AND THE FULL NAMES OF THE SENDER. WE SHALL BE EXPECTING THE ABOVE INFORMATION FROM YOU TOGETHER WITH YOUR PHOTO TO IDENTIFY YOU ON THE PIONT OF DELIVERY WHEN WE GET TO YOUR COUNTRY. FOR MORE URGENCY AND MORE INFO HUMBLY REQUEST YOU TOCALL +22506482972 NOTE THE COMPANY WORK ROUND THE CLOCK 24/24 HOURS SERVICE. I HAVE RECIEVED SO MANY MAILS FROM YOUR LITTLE GIRL MISS KOFFI APEALING TO US TO DO SOMETHING, ACTUALLY WE DO NOT COLLECT MONEY WITH BANK ACCOUNT WITH SUCH MONEY BECUASE IT IS TOO LITTLE, SMALL AND IT TAKES TIME TO BE CLEARED BUT FOR THE FACT THAT MISS KOFFI HAS BEEN APPEALING AND CRYING WITH SO MANY MAIL WE HAVE DECIDED TO GIVE YOU OUR BANKING DETALS TO SEND THE MONEY AND SOON AS YOU SEND THE MONEY TO OUR BANK ACCOUNT DO THAT LET US HAVE THE PAYMENT SLIP TO BE ABLE TO TRACE THE MONEY UNTIL WE RECIEVE IT TOGETHER WITH YOUR PHOTO, HERE IS OUR BANKING DETAILS IN THE NAME OF THE COMPANY SENOIR ACCOUNTANT, INCASE YOU HAVE ANY PROBLEM OR QUESTION OR FOR MORE URGENCY AND MORE INFORMATION WE HUMBLY REQUEST YOU TO CALL +22506482972 NOTE THE COMPANY WORK ROUND THE CLOCK 24/24 HOURS SERVICE. Bank Address: 01 B.P. 1355 Abidjan 01, RC Abidjan 2641, Abobo Branch - RCI.